i'm not in the habit of associating heavy rock with the art of cycling, but sometimes it seems so apposite that there really is no choice other than to capitulate. spinal tap are a ficticious group who formed the subject of a rockumentary by rob reiner entitled this is spinal tap. the most recnt reason for bringing them into the realms of velocipedinal discussion was guitarist nigel tufnel's assertion that the volume on his marshall amplifier, unlike the standard model, went up to eleven. not ten, but eleven. with the introduction of eleven speed cassettes by campagnolo a few years back, that spinal tap amplifier suddenly found itself in the cycling limelight once more. however, there are a number of spinal tap antics that, though incredibly close to the practices of many a heavy metal or progressive rock band, lend themselves to comparison with daily life. in this case, it comes down to one of misapprehension of size. keen to bring life to a concept song entitled stonehenge, tufnel scrawled some drawings on the back of a knapkin that he hands to their road manager in order that these may be realised in 3d to form a stage backdrop. unfortunately, it appears that his drawings were appended by measurements in inches that ought to have been in feet. therefore as the dry ice clears from the stage, and singer david st. hubbins reveals his visage from 'neath a druid's hood, a miniature scale model of stonehenge descends from the lighting rig to the stage floor. not unnaturally, this caused serious consternation between the band and road crew, each blaming each other. this misapprehension of scale is something that featured in my receipt of endura's latest roller kit bag when one arrived on the doorstep of washingmachinepost croft last month. i have spent many a london trip negotiating the concourse of euston station, deftly trying to avoid those tiny wheelie cases being trailed by many a would-be executive. oh how i wish they paid attention to just how far behind those little wheels are rolling; in most instances, those cases are scarecely larger than a musette, meaning that carrying instead of wheeling would hardly be an onerous task. endura's take on the matter is, however, several orders of magnitude greater than either spinal tap's stonehenge or those tiny wheels that inhabit euston station. 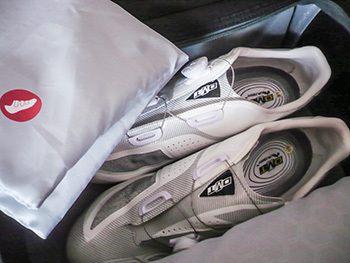 prior to its arrival, i had seen only a few illustrations of the roller kit bag, all of which featured a plain white background, and thus without any sense of scale. it truly is a substantial piece of kit standing 75cm high; a few more if you add in the telescoping handle (total height with the handle fully extended is 1.1 metres). the back is made of particularly stern stuff, highly resistant to pretty much anything you care to mention (i was thinking of aircraft baggage handlers), featuring two full-length runners and a sizeable pair of wheels. 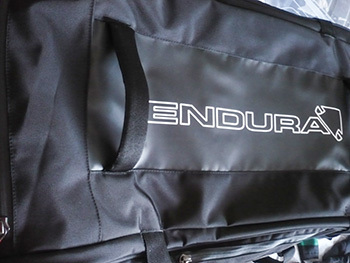 even when stuffed with every item of endura kit i could find, it stands perfectly stable. of course, versatility in an item of luggage is a great boon. in this case (pardon the pun), the roller kit bag can be manhandled in ways other than via its telescopic handle and wheels. there's a padded endura logo'd handle on the top, another on the side, and two on what would be classed as the front when stood on its end. 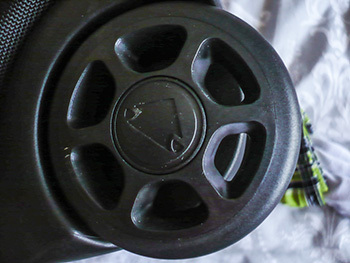 a sturdy double zipped closure occupies two thirds of the bag's circumference, allowing the bag to be sat on the floor or bed and opened in two halves. 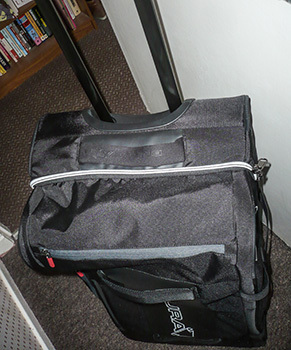 the left half features a zipped and pocketed mesh cover opening onto a full length luggage bay. 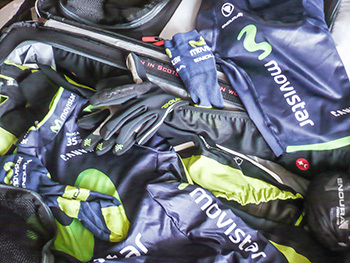 this is backed by a centrally zipped waterproof membrane and offers huge space in which to place jerseys, shorts, tights and softshell jackets. it is endged by three elasticated pockets. monogrammed to indicate space for socks, armwarmers, gloves, legwarmers, toiletries and any other of the smaller accoutrements that accompany the modern day velocipedinist on their extensive travels. the right half is not only divided into three distinct sections, it contains hidden treasures. 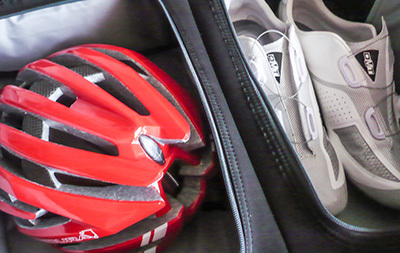 the bottom zipped and waterproof section is designated for shoes and includes a drawstring waterproof bag in which to place less than pristine shoes. my dmt road shoes fitted so easily, i figure it might just be possible to ease in a second pair. 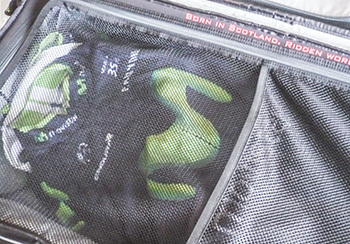 the next section up features a small helmet logo, and into which an endura helmet slid with ease, leaving quite a lot of space for other bits and bobs. lying inside this section is an enormous waterproof drawstring bag in which damp and dirty apparel can be placed, keeping it well away from any other items of clothing. if completely full, it would be easy to place this bag inside the leftmost section, or indeed, scrunched into the top third of the right side which has yet another zipped mesh closure. the ingenuity does not, however, end there. once you have satisfied yourself that this stonehenge of the luggage world is as full as it needs to be, 'tis but a simple matter of closing the two halves and closing the zip. but just to nip back to the aforementioned baggage handlers, in order that the two halves remain as intended, there are two adjustable elasticated straps placed at each end, clicking into cunningly concealed buckles on the lower half. 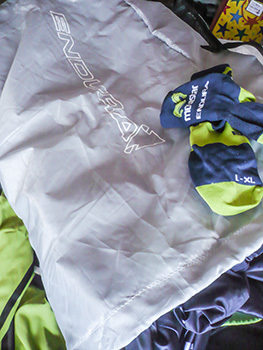 how often have you ended a ride in a wet car park or less than dessicated grass and had need fo removing cleated road shoes and race socks to change into something a tad more appropriate for wheeling the bicycle to your accommodation or packing into or onto the car? yes, me too. 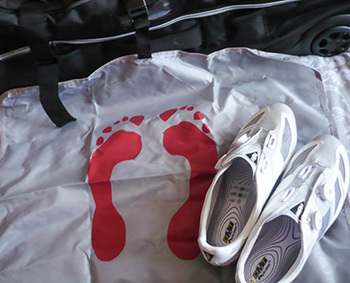 well, concealed inside a zipped panel on the side of the bag is a pull-out thin but sizeable waterproof mat, its use designated by two large red footprints on the top. brilliant. naturally enough, there's a windowed side panel into which your name address or brief description of your palmares to date can be inserted. adjacent to the telescoping handle on the top is yet another zipped pocket, ideal for bus, plane or train tickets, or indeed anything else to which you'll need easy access. i had hoped to undertake at least one lengthy journey (by my standards) with the bag filled with all manner of cycling apparel, but the plans of a famous cycling journalist are liable to change at the last minute (so i'm told), so i resorted to wheeling the selfsame filled bag over a less than table flat road near the croft. aside from surviving a highly crinkled road surface, the balance was a particularly notable; this made it quite easy to trail along behind without being overburdened with the overall weight.